The ergonomic and super comfortable fit of the Chest Plate Harness has dogs all over the world celebrating (we're guessing!). The Chest Plate distributes the load evenly across the dog's chest rather than the throat, to make walks enjoyable for both you and your furry friend. With an EVA chest support that moulds to the shape of your dog, every harness becomes a custom fit - there really isn't a more supportive and comfortable dog harness on the market! 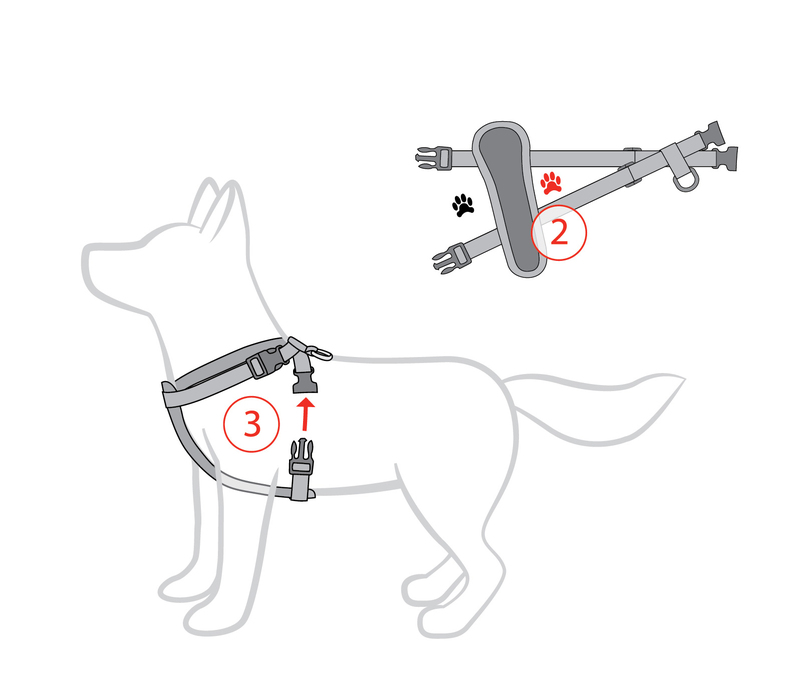 Thanks to the easy-to-adjust straps, the harness does not rub uncomfortably anywhere on the dog (Click the 'Fitting Instructions' tab to correctly fit your Chest Plate to your dog). The icon shape of the chest plate itself has been meticulously designed and tested to fit every dog type, so whatever your breed - the Chest Plate Harness is the perfect choice. "Am thrilled with this harness & my Staffy girl looks gorgeous in it too.....She was so excited at wearing it, so she obviously felt very comfortable & thought she looked very special...Such a bargain, & super speedy delivery....Measurements were 'spot on' too...."
" I still have to try out this product on my 10-month Dobermann. Unfortunately, I initially ordered the wrong size (Large) and am just waiting for my replacement order (XLarge) to arrive. I came across the EZYDOG website quite by accident and I liked what I saw. Also, all my communication with your very accommodating Staff so far has been quite pleasant. Thank you for a great online service! They are extremely strong, my dog is comfortable & I have control. I can relax & enjoy our walk knowing we’re all good. My Ebony is 13yr now & her chest harness was 10 yrs old, although wearing, it was very useable until my newbie chewed the catch! I’ve just ordered another two. Tried other brands, came back to Ezydog. " "Great quality and enough room for a neat fit"
"I regularly harness dogs at an animal shelter and ezydog chest plate harnesses are the best. They fit all dogs and are so easy to fit and adjust. The material is fantastic and they last for a long time even in a busy kennel environment with lots of chew-friendly dogs. the designs are also beautiful which makes our rescue dogs even more adoptable:) so overall highly recommended and I will keep buying them for our beautiful doggies"
"I constantly struggled with previous attempts to walk my dog calmly but this harness is great for her! Wish I found your website years ago." "I bought this online after having bought a no pull harness (sporn) from pet shop which worked but was fiddly and annoying to get on and looked uncomfortable when she walked. They did in fact talk me out of buying the ezydog chest plate harness saying it wouldnt stop the pulling- but believe me, it does! I took the sporn back and ordered this instead with the zero shock leash. Superfast postage too. OMG what a difference to walking the dog it has made. My 7 year old staffy granddog who has never learned to stop pulling with a collar and leash, now walks like a dream girl - no pulling - responds to the leash and directions, stopping etc - such a good girl. And it looks pretty comfortable on, fits beautifully, very adjustable, easy to put on her and the safety seatbelt accessory is a bonus. Wish we had bought one for her years ago! Worth every cent. "Great quality. Easy fit and comfort for my dog"
"Just love this harness, it's made walking my 5 month old heeler so much easier she doesn't pull anymore and I have more control. High quality product no regrets in buying. I got size L and it should last until she's and adult as it's very adjustable. Super easy to pop on and off too." "This is the best dog walking harness I have purchased. It is comfortable and secure and looks great as well. I have a large breed dog, a Weimaraner, and the harness also gives good control for a dog that pulls. Highly recommended!"